Cape Croker Park is owned and operated by the Chippewas of Nawash Unceded First Nation. It’s located on the eastern shore of the Bruce Peninsula in Ontario, Canada and nestled between 2 hefty limestone bluffs. 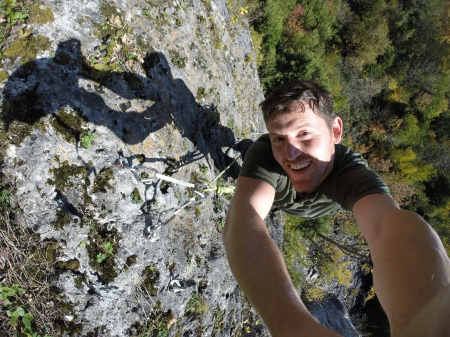 Cape Croker offers pretty good quality sport and trad routes. Other areas just down the road are Lion’s Head, TV Tower and White Bluff, which are more popular and better known for climbing then lil Cape Croker. BUT! You make a nice day or two of climbing at Croker and then head just around the corner to the other areas for a nice lil climbin’ trip. I couldn’t find a guidebook for this area or even a half decent website with the climbs from this area. My 1st day here I just hiked in to what looked like the crag. When I pulled out my phone to get GPS coordinates, I found a very handy Google Maps tool that had the crag area and a handful of the climbs with descriptions. Score! This combined with rock climbing dot com’s site, Iw as able to piece together all the climbs and had a map with gps coordinates for where everything is. All of this and legendary fall weather was all I needed for an amazing climbing weekend. (*Warning*..only use this for the climbing descriptions and grades in the Right and Left Ladder links. The approach info and most other info on this post is completely WRONG). Need a rest day from climbing? Rainin and can’t climb? Have kids and looking for something fun? Greig’s Caves is a beautiful lil’ hiking area and a very short drive from the climbing crags and hiking trails on the coast of Georgian Bay. The caves refer to 10 limestone caves that have formed over the past couple of years (…maybe longer). They’re pretty and downright amazing to look at. It takes about an hour to do the circular hike.